I've been MIA for awhile. The planning and organizing for the 1st Annual Noah's Memorial Classic took a lot out of me. Especially at 8 months pregnant!! But I am so happy to say our event to honor Noah was a tremendous success!!! We started planning the golf tournament soon after the first of the year. Our good friends at Acceleration Northwest were kind enough to sponsor the tournament. And not only did they sponsor us, but they did a lot of work with the organizing of golf, financials, etc. We could not have done this event without them. I've never even attended a golf tournament before, let alone planned one. But somehow we pulled it off! On July 22nd, we had 160 golfers at Fox Hollow Golf Course on a 95 degree day sweating their butts off for such a great cause! We are so thankful also for our 20 hole sponsors! I give major credit to the ones that sat at their hole all day in the heat! We had games at some of the holes to help us raise money and also offer incentives to the golfers. At each hole there was a photo of Noah along with another baby who has lost their life to SIDS. While we planned this event to honor Noah, it was not only for him. It was for all his friends in heaven who have lost their life way too soon. We had an additional 125 people join us after golf for dinner. So all in all we had almost 300 people at our first event! We sold jewelry, had a raffle, a band (thanks to our friends Jerry Rodes!! ), and over 100 silent auction items. After the night was over, we took the balloon decorations and had a balloon send off to Noah. It was the perfect way to end the evening. After it was all said and done we raised close to $25,000! The money we raised will go to the CJ Foundation for SIDS and Faith's Lodge in Noah's name. Both of these foundations are very near and dear to our hearts and have been a huge support to us over the last (almost) 10 months. We wanted the money we raised to go to the research of SIDS as well as helping families who have and unfortunately will lose their child in this horrific way. We've kept a small chunk of money in the account for the holiday season. We plan to adopt a family and donate toys to Toys for Tots in Noah's name. Noah LOVED all his toys and we know he'd want us to help other kids who are not as fortunate to have toys to play with. My very talented friend from West Meadow Photography donated her day and expertise to taking pictures to document our day. Thank you to everyone who contributed in some way to helping make this event such a success! We are so thankful to everyone for wanting to honor our son. We know Noah would be so proud and that makes us happy. I never imagined I would be planning charity golf tournaments in my child's name. It's just not something you think you should ever have to do. I still can't believe he's not here. It just baffles me that this is my life. I miss him more than words can ever describe. While I'm blown away by everyone's support and generosity, I wish everyday I could just have my son back instead. This was all for you Noah! We love and miss you so much peanut! 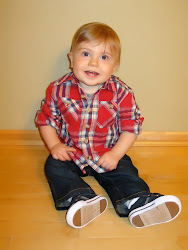 Noah's Memorial Classic will become an annual event where we can honor the most amazing little boy who only got a short 11 months with us, to help raise money for SIDS research and awareness, and to help other families who know the pain of losing a child. We appreciate your continued love + support so much! !